Today your international flight will arrive at the Capital Airport. After you reclaim your luggage and clear the customs, you will see our guide are expecting you outside the customs of the airport, holding a sign on which your name is written. We will transfer you to the hotel and help you finish the check-in procedure. The remainder of the day is free for you to rest or explore. Your 15 days China tour for seniors or families begins this morning as our guide escorts you to visit the grand Tiananmen Square and the splendid Forbidden City. It is always a nice choice to preview the world largest city square before starting your historical exploration in the 590-year's imperial palace. We know it will be a great physical challenge to visit the 9,999 rooms of the Forbidden City, of course, you don't have to. As is our practice to avoid the cheap tourist restaurants, you will enjoy an a la carte lunch (valued at CNY150.00 per person and included in our price) at a noted local restaurant to taste the authentic Chinese food. 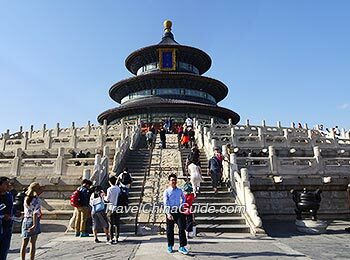 This afternoon, you will take a leisurely pace to visit the Temple of Heaven - the largest royal temple in China. Travelers are always surprised by the predominant architectural and aesthetic achievements of ancient Chinese people. Please wear a pair of light and skidproof shoes, because you will hike on the zigzag Mutianyu Great Wall today. This section was first built in Northern Qi Dynasty (550-557) and rebuilt in the early Ming Dynasty (1368-1644), which is also one of the best-preserved Great Wall sections in China. To save your energy, we will arrange the round trip cable car for you. Since the restaurants near tourist spots have low quality food, we do not arrange lunch today. But our guide is willing to show your some restaurants. On the way driving back to downtown area, you will take a glance at the Bird's Nest for 2008 Olympic Games and take some pictures. Finally, the guide will head you to a famous local market and leave you some free time for exploration. To spend your last day in our capital city, you will go to visit the existing largest royal garden - the Summer Palace. Once as the resort for the imperial families, the palace was constructed over 260 years ago. After that enjoy the old local culture and local customs by visiting narrow alleys, also called Hutongs. You may take a special rickshaw riding through various Hutongs and enjoy the prosperous street view with dazzling goods on sale. Through a visit to the local family, you will get a further understanding of the old Beijing characteristics. Lunch is not included today. In the afternoon, you will visit the 798 Art Zone and then continue to the airport to take a flight to Xian. Our guide will expect you outside the airport baggage claim area and transfer you to the hotel. This morning, you will see the splendid Chinese army of 2,200 years ago at the Terracotta Warriors and Horses Museum. It is one of the highlights of your 15 days China tours. All of the full-scale warriors and horses were used to protect the great Emperor Qin Shi Huang after his death. Lunch is not included. Afterwards, there is a visit to the Big Wild Goose Pagoda, the representative Buddhist building of 1,300 years ago in the Tang Dynasty. The following Provincial History Museum will show you thousands of priceless historical relics spanning from the primitive society to the last Chinese empire. The well-preserved City Wall of the ancient capital is your first destination today. Other than a military defense, the 13.7 kilometers wall has been an ideal place for holding a marathon game every year. Later, you will have a local family visit and a la carte lunch (valued at CNY120.00 per person and included in our price) will be arranged in the home of the family that you visit, to taste the authentic home cooked Chinese food. 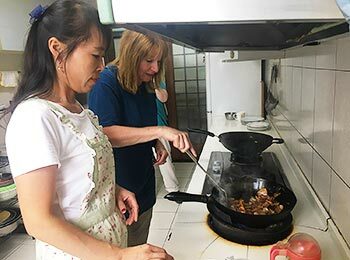 If interested, you may choose your preferred dishes from our Chinese food cooking class and learn with the host. In the afternoon, you will visit the Great Mosque at a leisurely pace. We will give you some free time to explore the nearby lively Muslim bazaar on your own. We will arrange a trip to Xian Museum and the Small Wild Goose Pagoda this morning. As one part of the museum, the Small Wild Goose Pagoda is a famous tourist attraction and was built for keeping the Buddhist scriptures and Buddha figures brought back from India by eminent monk Yijing during the Tang Dynasty. After that, you will take a flight to Guilin. 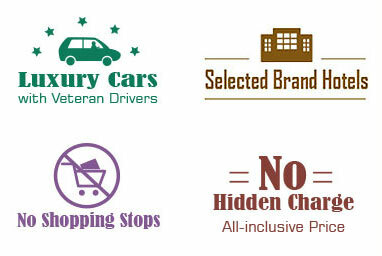 Our local guide will expect you at the airport and then accompany you to the downtown hotel. Please enjoy your breakfast at the hotel and then our guide will transfer you to take a cruise along the Li River downstream to Yangshuo. On the ship, you could enjoy a series of charming sceneries and astonishing landscape. Upon arrival at Yangshuo, you will check in at the hotel. After a short rest in the hotel, you will be driven to the countryside of Yangshuo to appreciate the rural scenery. Along the way, a visit to a villager's home will be arranged, where you can experience the local farmers' lifestyle. For dinner tonight, we suggest you dine at one of many cafes and restaurants in the famous West Street. Tips: The lunch served on the cruise today is simple Chinese box lunch. It cannot be up to your taste and also fails to meet the serving standard of TravelChinaGuide, so we kindly suggest you have a hearty breakfast at the hotel this morning. We remain the whole morning free for you to walk around this small but charming town, such as visiting the exotic West Street and enjoying your time leisurely in some cafes or bars. For new couples, having a leisurely honeymoon here would be a special experience. 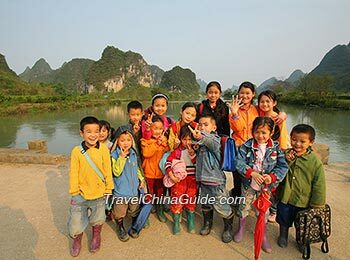 Our guide will transfer you back to Guilin in the afternoon and arrange a half day visit in the city. Your first stop will be the Reed Flute Cave. This limestone cave consists of various kinds of stalactite and stalagmite, a great creature of the nature. The following Steven Star Park should be a large treasure house of natural scenery, including graceful water, charming hills and magnificent limestone cave. The last stop is the Elephant Trunk Hill which is the landmark of this picturesque city. The huge hill just looks like an elegant elephant drinking water in the wild Li River. 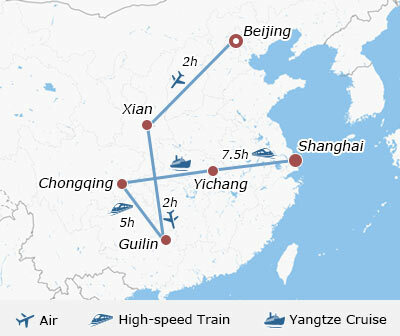 Today, you will take a morning bullet train for around 5 hours to Chongqing. Our local guide will expect you at the railway station and transfer you to Jiefangbei CBD - the most prosperous business circle in Chongqing where you can have a look at the monument and stroll around the street. The next stop is the bustling ancient town of Ci Qi Kou. Over there, you will find many old houses in the style of Ming and Qing Dynasties, converted to characteristic stores selling local snacks, Chinese paintings, antiques and traditional tea houses for you to explore. After that, we will transfer you to the pier to board the luxurious cruise ship. As the ship sails at 21:30, your exciting Yangtze tour begins. 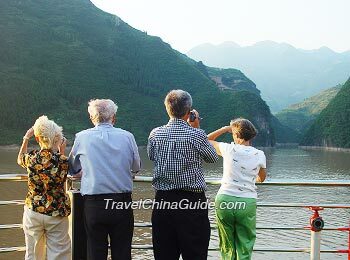 China tour including Yangtze cruise is quite suitable for senior travelers. Guests will stay 3 nights on the cruise and spend their time at a leisurely pace. At about 08:00, you will have a shore excursion to Ghost City of Fengdu. Having nearly two thousand years of history, the Ghost City combines the cultures of Confucianism, Taoism and Buddhism with the mystique of ghosts. You will not only see many old-style buildings and statues of legendary figures but also learn about the unique Chinese ghost culture here. For people who take President Cruises, you will have a shore excursion to Shibaozhai in the afternoon. Then the Captain's Welcome Party will be held tonight. You are welcome to join in. Today you will see one of the highlights of the cruise journey - the Three Little Gorges or Shennong Stream. On the sailing to Wushan, the ship will pass the steep Qutang Gorge and the zigzagging Wu Gorge. Upon arrival at Wushan, you will board an Eco-friendly ferry sailing into the remote section of the Three Little Gorges. After three to four hours' adventure, you will be back onto the cruise ship. The cruise continues sailing into the Xiling Gorge. Early in the morning, you should pack your luggage and check out the ship, then disembark for an excursion to the Three Gorges Dam. There is a bus driving you to the peak where you could overlook the huge Three Gorges Dam composed of the dam, the hydropower stations and the navigation facility. After that, the cruise ship company will transport you to the Three Gorges Tourist Center in Yichang city and our local guide will meet you there and then transfer you to take a bullet train to Shanghai in around 7.5 hours. Our local guide will expect you at the railway station and transfer you to the hotel. Your first stop of private Shanghai tour is the Shanghai Museum, which is a fantastic art gallery exhibiting bronze, ceramics, paintings, jade and furniture of ancient times. The next destination is the famous Yuyuan Garden, an elegant private garden built 400 years ago. You will feast on an a la carte farewell lunch (valued at CNY150.00 per person and included in our price) at a fancy and famous local restaurant, which offers authentic Shanghai and Cantonese cuisine. 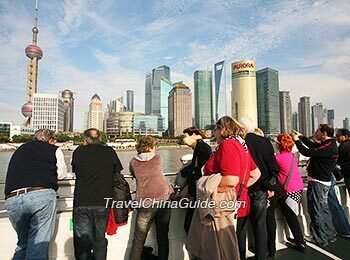 In the afternoon, you will take a short cruise along the Huangpu River to obtain different city views of both banks. After that, we will leave you some free time to walk along the Bund area at a leisurely step and then visit an old street. Our guide will transfer you to the airport today. You will take the homebound flight with uncountable pleasant memories. Wish you a safe journey back home. 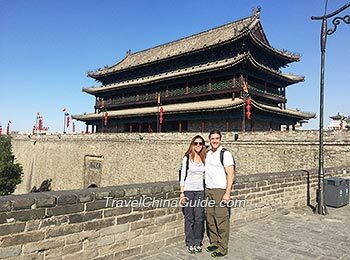 Covering the most classic travel destinations of China, this two weeks long China tour is a good choice for couples, family with kids, or senior travelers. All arrangements of the tour can be customized to meet the specific interests. 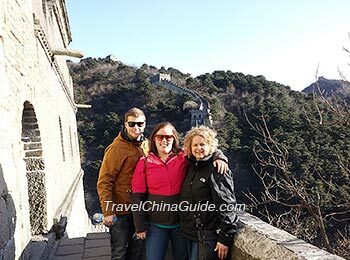 I want to start off by thanking my travel consultant Linda for her help in booking our fantastic journey of China. We really appreciated the opportunity to meet Linda in Xian. Let me tell about our experience on our journey. We picked this company to arrange our China tours and were extremely satisfied with our journey and guides, and we picked our own hotels but overall is well arranged. 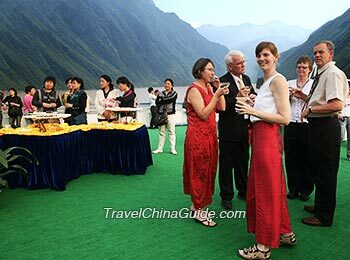 How long is the Li River Cruise? Would we be able to do a Yulong River raft tour instead of the Li River cruise? If so, would this be a worthwhile switch? 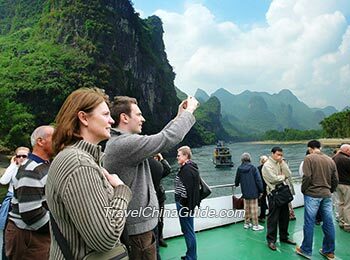 The Li River Cruise takes about 4 hours from 09:00 to 13:00. The big ship sails from Guilin to Yangshuo and you could see the beautiful karst landscape along the way. While Yulong River is in Yangshuo. It is a lovely and peaceful river, where you could enjoy the calm bamboo boat ride down the river and see lots of little farms and local villages. It is a short journey. If you have enough time and money, I suggest you have both of them with different experience. We will visit Shanghai for 4 days starting in April 22nd. I wanted to know if there are still some places where we can find the cherry bloom. Hi, there are several popular places that can enjoy the cherry blossom. If you have enough time, you are suggested to go to Gucun Park, Luxun Park and Botanical Garden. Have a nice trip! Is the hotel in Beijing a central located, free WIFI and price that includes breakfast? Yes, we arrange the 5-star Crowne Plaza hotel in Beijing for our luxury series clients. This hotel is centrally located in the famous Wangfujing area with a convenient access to various locations. Free wifi is available in each room and daily breakfast is included. Thank you. when is the best month to go to your country to really enjoy the sceneries? If you mean the places above, almost all the year around are suitable for you to visit the places except Yangtze. As for the best months, April, May, September and October are most suitable?